Every Saturday, Dawson and Randy spend some special time together, which allows Brady and I to spend some quality time together. 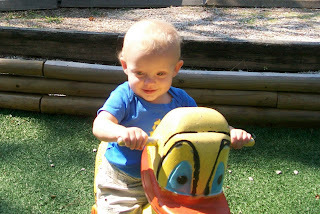 One recent Saturday I took Brady to the park. 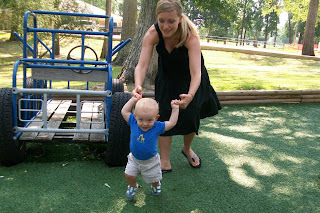 He loves walking on the artificial grass, exploring the playgrounds, and swinging. 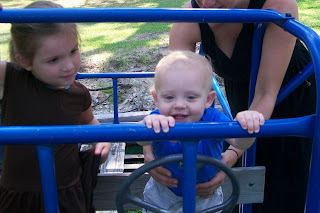 Oh, and he's also very fond of climbing up the slides. He even climbed all the way to the top of the tube slide the other day!! 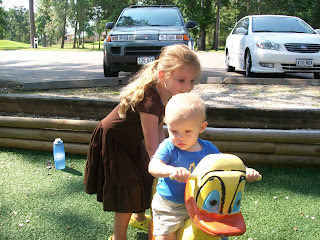 Kaelin helping Brady bounce on the duck. 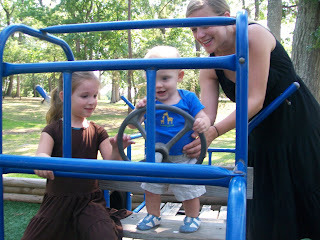 Driving the truck with a little help from Angie and Kaelin. Trying to climb out of the truck. Speed walking over to see me. Look at that face - he's so excited! !